Posted by henry000 in atheism, Christianity, discrimination, faith, fundamentalism, hate-crime, hoax, OUT campaign, religion, Sam Harris, statistics, Texas, United States. Check out this reader’s letter to a newspaper – tell me if I should laugh it off or see it as some sort of hate-crime? 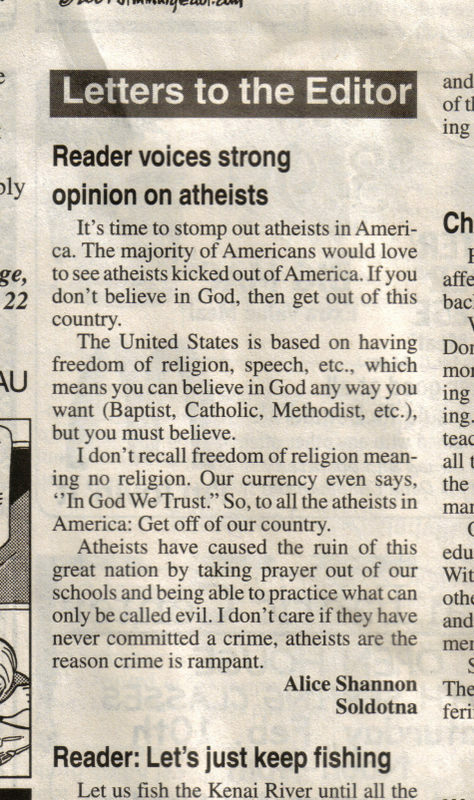 Surely if we replace the word “atheists” with some other minority group, the letter would never have been published. Courtesy of this page here (via Reddit). Unfortunately not much else information is given on this letter. Of the twenty-five cities with the lowest rates of violent crime, 62 percent are in “blue” states and 38 percent are in “red” states. Of the twenty-five most dangerous cities, 76 percent are in red states, 24 percent in blue states. In fact, three of the five most dangerous cities in the United States are in the pious state of Texas. The twelve states with the highest rate of burglary are red. Twenty-four of the twenty-nine states with the highest rate of theft are red. Of the twenty-two states with the highest rates of murder, seventeen are red. where the “red” states are the conservative religious states and the “blue” states are the more liberal states. It is worth noting that the writer of the letter is not anonymous – which I suspect by choice – which to me seems to reflect the general anti-atheist sentiment held by the majority in the US. I suppose it is precisely because of this sort of hatred that the OUT Campaign is designed for – although not unexpectedly it has also convinced atheists to continue to hide their views. No, in the United States, even “hate speech” is protected; one could indeed write this and replace “atheist” by “African American” and still be within the law. For example; some local neo-nazis put out flyers about me (this was a racism thing) and it was legal (though I might have been able to make a case for libel). Nevertheless, this letter displays great ignorance and hatred; I wonder if this moron would take life saving medical treatment that was developed by all of those atheist scientists? That “in God we trust” is written on coins doesn’t mean anything. In fact, it’s probably unconstitutional (violation of chuch & state separation). Neither does “freedom of religion” mean that you have to believe. I’m free to spread any flavour jam on my sandwiches, but it doesn’t mean I have to have a sandwich at all. People like this make me embarassed to call myself a Christian. Generally my argument for people like this is to use their own beliefs against them. After all, in Christian beliefs, God gave us the free will to either accept Him or reject Him, the logic being of course what use is it to have people who love you if they do so by force, not choice. So if Christians truly wanted to emulate God’s authority, they should rigorously fight for others’ rights to be atheists, because God gave us that ability to choose. Therefore if there is a God, which the Alice Shannon obviously believes there is, isn’t her desire to take away what God gave us a bit of a slap in the face to her God? As if she knows better than Him? dana: I think it goes something like this: the Hebrew Bible (commonly called the Old Testament) is chock full of episodes where their deity punished the whole community for the non-belief of a few (or the non compliance of a few to divine dictates). Of course, the writer says it is ok to be a slightly different believer; remember that the early Muslims cut some slack to “people of the book” (Jews, Christians) but not to others. That letter was/is a hoax. It’s not easy to write these words, especially when we take so much pride in being the best — and most accurate — information source for the central Kenai Peninsula. It all started Jan. 18. That’s when a letter came across the editor’s desk. The letter fell within our requirements — it included a name, local phone number and address. But it wasn’t until we read it that it raised our eyebrows. The letter was from Alice Shannon of Soldotna. The Clarion has received many angry letters over the years, but this one truly got our attention. Should we print it? Is it libelous? Is it relevant to the public’s interest? Does it cross the line of what we think Clarion readers want to see? The decision was not taken lightly by any means. But one was made out of optimism. What we wanted to see was what our readers thought about this letter and how they would respond to it. We never questioned Ms. Shannon’s sincerity. We felt she had laid it all out there for everyone to see. So the letter was printed. True–of course that was also pre-Jesus. In the Old Testament, sure the noncompliance of a few was highlighted, but the others also were guilty of something. Indeed everyone in the history of creation has failed to live up to God’s rules and deserves punishment, according to many religions. I’m sure Alice has done a thing or two in her life that would make me concerned to stand next to her in the presence of a vengeful God. Jesus’ sacrifice was intended to satiate God’s wrath, so those who believe that is true shouldn’t be worried about being demolished now. And so what if they are demolished? Christians are taught to put their hope in eternal life, not our current mortal life. To live life with the notion that “gee if only such and such a thing wasn’t here, life would be perfect,” again is insulting God and denying one’s own role in the imperfections of this Earth by pretending he or she is perfect like God. Thanks blueollie…good points. I suppose I shouldn’t assume Alice is a Christian. Perhaps she is Jewish and strictly follows the Hebrew Bible. Something tells me that’s not the case. Oh my gosh are you kidding me!!!!! I worked at a newspaper. You know why we request your phone number with a letter to the editor? So we can CALL the person BEFORE we print the letter and verify that they are in fact the author and that they indeed want the letter to run. Now I’m annoyed on all kinds of levels. Igorance isn’t much of a survivor quality, is it? Shouldn’t everyone, Christian or not, be taught simple, common, everyday politeness? As in, love everyone for their good qualities, not hate a few for their flaws? Organized religion teaches people values, morals, “love for all mankind,” and “how to be a better person.” Ostensibly, this should also mean tolerance. Zealots and ambitious politicians will distort and twist any teachings to obtain support. No religion, that I am aware of, teaches hatred. Religion should espouse humanity. It’s a sad day, indeed, when religious supporters spew hate. The letter is a hoax. The blog post should be changed to reflect it. Or shall we bring up the statistics that show that agnostics and athiests give far less of their time and money for good causes? How many Christians commit these crimes that are cited above? Stats can mean anything you want them to mean. They shouldn’t however, be used to demonize people alongside a hoax of a letter. Hey crazypastor – did you ever read about this study? Thanks for the link, and very cool name by the way. As they said themselves, it’s the first study, and not a definitive study. (It could even be wrong) But regardless, religion and especially religiosity, don’t save, necessarily help, or change anyone. In my opinion. I would say the dark ages were awfully dysfunctional and they were very religious times. If you were to measure evangelicals who hold to the six core beliefs of the Bible, as barna.org does every year, you find real discernable differences. (Core beliefs do not include the age of the universe) If you measure “religiosity” you will not find the same differences. Barna Research has looked into this for many years, in fact, the study above is actually not the first. At any rate, real faith in Christ changes a person, and helps a person, religion doesn’t. Dana: remember also, the very post resurrection Inquisitions, not only done by the Catholic Church, but also done by people like Calvin. Killing people because of their beliefs used to be the norm. Thanks EvilPoet for pointing out that it was actually a hoax! Well I suppose in a way it is good that the letter isn’t real, then again, why would the editors of Clarion publish it in the first place?